A new report on refrigerated trailer market provides in-depth understanding of the growth path along with future scenarios based on past performance and current scenario. The report offers an exclusive analysis of the global market and also presents insights on key regions and other key segments that have been covered in the executive summary section. The report offers a summary of the global market including an official abstract that highlights the core instances progressing in the market. It also discusses vital indicators such as drivers, challenges, and trends prevalent in the global market. The report aspires to serve as a useful guide providing figures related to volume, value, and the development rate of the market from a growth point of view. The report thoroughly looks into each segment and provides estimates based on historic and current values. The assessment of the refrigerated trailer market presented in the report is in the light of market conditions, including value chain analysis of key products and end use under study. The report is developed by collecting data employing primary as well as secondary research. The data gathered through primary research involved conducting extensive interviews with industry experts and the information provided by respondents was cross-checked with accredited sources. The secondary research comprised collecting financial and yearly reports of the key companies. The report also provides market segmentation and regional analysis of the refrigerated trailer market. The report focuses on qualitative and quantitative aspects of the market, to offer an estimation of the market size, revenue, CAGR, and Y-O-Y growth. The information on technological advances in the global market has also been covered in the study that helps to identify growth opportunities. The report also provides market attractiveness analysis for both existing as well as new companies. The complete analysis of the refrigerated trailer market presented in the report is based on industry-best analytical tools such as Porter’s five force model and SWOT analysis. Information on the advanced technologies being adopted across the overall refrigerated vehicle market has also been covered in the report. The report includes a detailed profile of the key companies currently operating in the market. The companies are profiled on the basis of key parameters such as company and financial overview, latest developments, product portfolio, and long-term and short-term growth strategies. The competition matrix covered in the report is likely to assist the existing players to boost their market shares and new entrants in the market to establish a foothold in the refrigerated trailer market. The report also sheds light on regulations in different countries in the global refrigerated trailer market. The report talks about the manufacturing and sales of refrigerated trailers along with the new research and key development initiatives underway in the global refrigerated trailer market. What does our report offer? The report is the outcome of meticulous research work carried out by market analysts employing reliable industry-centric tools. The information collated has been validated by seasoned market researchers. 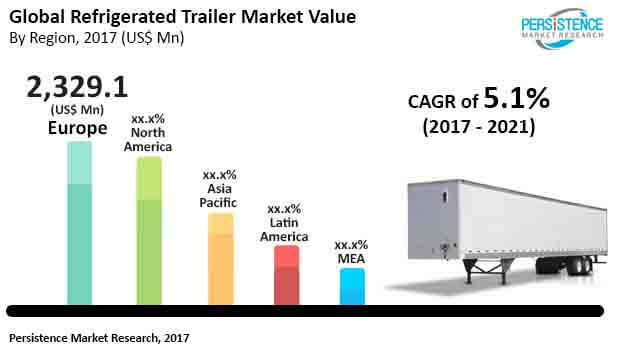 Across several parts of the world, economic growth and changing lifestyles are indirectly benefiting the global refrigerated trailer market. Rising urbanization coupled with a growing middle class population are leading to increasing adoption of ready-to-eat food that does not require preparation. Increasing practice of nuclear family setups along with rising women in the workforce does not leave adequate time for fresh cooking on a regular basis. This has fueled demand for ready-to-eat food products that are transported through safe temperature controlled transportation channels. In addition, with the rising demand for perishable food such as fruits, vegetables, meat, and seafood, cold chain capacity is predicted to expand significantly especially in emerging economies. This, in turn, is likely to drive demand for efficient refrigerated food transportation and cold storage infrastructure. The rising demand for dairy products is also acting in favor of the refrigerated trailer market. Rising awareness about the health benefits of dairy products such as yogurt and cheese is leading to their increased demand. Consumers worldwide are incorporating dairy products in their everyday diet that are a good source of protein and essential minerals. The easy availability of dairy products in on-the-go packaging formats is leading to their increasing consumption among office goers and students. The transportation of dairy products, however, requires reliable cold chains and refrigerated vehicles with temperature controlled environment in order to prevent spoilage and maintain safety of foodstuff. Besides this, implementation of stringent government norms to increase food safety and reduce food wastage especially in emerging economies such as India and China is anticipated to create significant demand for refrigerated trailers in the future. Increasing capital expenditure of third-party logistics businesses is a key factor behind the growth of the refrigerated trailer market. Truck trailers both refrigerated and non-refrigerated are major assets of third-party logistics companies that are routinely upgraded with latest technology to meet changing consumer demand and improve operational efficiency. These companies operate refrigerated trailers for a period of about 3-5 years, following which they are discarded and new ones purchased. This is boosting the refrigerated trailer market. A strong demand for replacement of refrigerated trailers is a key trend that has come to the fore in recent years. Companies in leading domestic markets such as the U.S. replace commercial transportation fleet regularly to upgrade their technological capabilities that can minimize turnaround time. Considering these driving factors, the global refrigerated trailer market is predicted to rise at a CAGR of 5.05% for the forecast period between 2017 and 2021. On the flip side, rising costs of hiring truck drivers, hike in fuel prices, and increasing truck prices are some of the factors spiking operational costs for logistics companies. This, in turn, lowers their profits thereby reducing their inclination towards making new purchases of refrigerated trailers. Increasing investments and R&D initiatives for the manufacturing of reduced weight vehicles is likely to offer new opportunities to the refrigerated trailer market. The newer vehicles will help curb carbon emissions and improve fuel efficiency that are drawbacks of predecessor vehicles. Among the key product types, chilled refrigerated trailers account for the leading segment in the global refrigerated trailer market. However, frozen refrigerated trailers are anticipated to surpass in terms of growth rate in the upcoming years. In terms of end use, meat and seafood is the leading segment mainly because of increasing consumption of meat and seafood. North America is the leading regional market for refrigerated trailers mainly because of strict government regulations that monitor safe transportation of food products. Kögel Trailer GmbH & Co. KG.